Here at Walker Books we are very excited to be starting off 2012 with a whole new hamper of Picture Book Picnic books for you to discover. 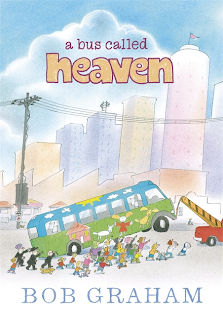 And what better way to kick off the fun than with the award-winning author-illustrator Bob Graham’s A Bus Called Heaven. Could an old, broken-down bus really unite a whole city neighbourhood? One morning it appeared, out of nowhere, sitting right outside Stella's house - a broken, old bus. On the front of it, held up with packing tape, is a hand-painted sign that says, "Heaven". How did it get there? Everyone wonders ... but no one knows. Then, out from the shadows steps pale Stella, normally so shy. 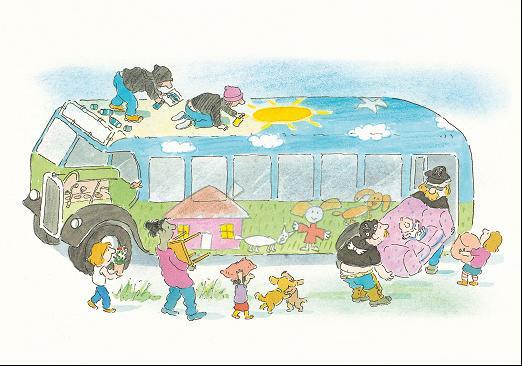 She climbs onto the bus and, in a moment, sees everything that it could become: "This bus could be ours," she says. And so, the lonely old bus - with the help of some colourful graffiti - becomes a hub of activity! People rally together to hold meetings, play games and share stories; sparrows nest where the engine used to be and snails make their little homes under the tyres. But one day a tow truck arrives and threatens to take away not just the bus, but everything that everyone has worked so hard to create. Following the riots in London and other UK cities last year, this book couldn’t come at a more appropriate time. Rediscover the power of community in this beautiful Amnesty-endorsed picture book. Told through a combination of bright comic strips and full page drawings, Bob Graham’s simple yet reassuring illustrations make this a humorous and heart-warming tale that will stay with you long after the final page. A Bus Called Heaven by Bob Graham out now in hardback, £11.99. Welcome Bob Graham, our Guest Blogger!